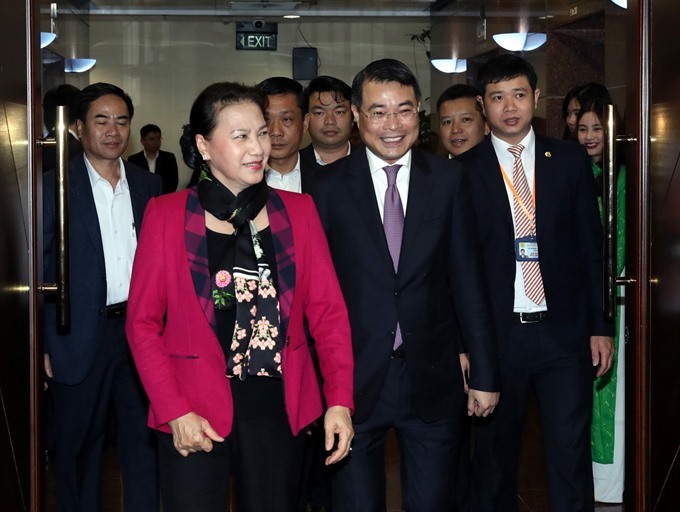 HÀ NỘI – National Assembly Chairwoman Nguyễn Thị Kim Ngân and other leaders visited and extended Tết (Lunar New Year) greetings to the Commercial Bank for Foreign Trade of Việt Nam (Vietcombank – VCB) and Việt Nam Customs on the first working day of the Year of the Pig yesterday. On the occasion, State Bank of Việt Nam Governor Lê Minh Hưng emphasised Vietcombank as one of the country’s best banks in completing missions set by the Government and SBV for the banking sector. On behalf of Party and State leaders, NA Chairwoman Nguyễn Thị Kim Ngân expressed her best wishes to all Vietcombank leaders and workers for the year ahead. In 2018, Vietcombank achieved the highest pre-tax profit in the banking system and the highest ever at nearly VNĐ18.4 trillion (US$791.2 million). Ngân applauded Vietcombank’s efforts to cut its bad debt rate to 0.97 per cent and expected the bank to develop sustainably, maintain low bad debt rates, improve workers’ welfare, contribute to the State budget and drive the country’s growth. At Việt Nam Customs, NA Chairwoman Ngân stressed the agency’s efforts in implementing the one-stop-shop customs mechanisms and facilitating commercial exchanges. On the same day, Deputy Prime Minister Vương Đình Huệ visited and extended Tết greetings to the Việt Nam’s Committee for State Capital Management at Enterprises (CMSC) and Việt Nam Posts and Telecommunications Group (VNPT). During his visit to CMSC, Huệ stressed the mission to transfer all 19 State-owned economic groups and corporations to the committee. It was urged to work with ministries, the Government Office, the Steering Committee for Enterprise Renewal and Development and other agencies to resolve difficulties in receiving these corporations. By the end of this year’s first quarter, a white book on the Vietnamese business situation will be published, aiming to enhance transparency. At VNPT, he expressed his appreciation for the corporation’s achievements in 2018, with revenue of nearly VNĐ155 trillion ($6.6 billion). VNPT led in setting up the e-Government, establishing the digital infrastructure and stimulating digital transformation in sectors of health, education and smart cities.